Winay Wayna means "forever young" in Quechua which is also the name of a pink orchid. Winay Wayna is an Inca site, neighbor to Machu Picchu, situated with views of the waterfall on the hillside above, and the Urubamba River below, it is likely that this site was a religious center associated with water. The ruins consist of upper and lower house clusters, interconnected by a long, precipitous staircase with accompanying fountain structures, often referred to as "baths." A large area of presumably agricultural terraces lies just north of the house-staircase complex. The site is not unusual for those in this region: compact formations of architecture that conform to, and often take advantage of the local topography. The stonework is variable in quality, but significant portions are of high quality cut stone assembly. 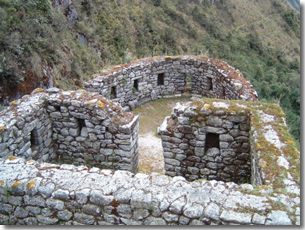 The site's lookout nature, its positioning near the important Inca access road, and the investment represented by it's architecture suggests it a place of some importance during the Inca occupation of this segment of the Urubamba drainage.